Over six, one hour episodes and through a lavish accompanying book, Michael regales the viewer with his adventures through the various countries and kingdoms in this enchanting part of the world. Western travellers have long been attracted to the Himalayas for its magnificent mountains, deep mysticism and colourful cultures. Outside of the more heavily trafficked regions of Nepal and India, lies the secluded and peaceful kingdom of Bhutan. Once a reclusive and isolated country, Bhutan is now cautiously opening its doors to tourism, ever mindful of the “corrupting” influences of western culture. This remote, isolated kingdom appears to stand still in time while the world rages around it. Like some real-life Brigadoon, Bhutan carries on untroubled and unfussed by the tribulations elsewhere on the planet, providing a whole new meaning to the hackneyed old phrase “getting away from it all”. Bhutan is truly one of the last remaining outposts available to the world-weary traveller. Parochial without being backward, introspective without being paranoid or hostile, the Bhutanese appear blissfully ignorant of the stresses and anxieties that plague us in the so-called modern world. In final episode of the series, Michael passes Tiger’s Nest Monastery and treks towards the Base Camp of Chomolhari where he meets Dorji, a nomad with a penchant for yak songs. Heading down to Paro in time to enjoy the great Buddhist festival, or Tsechu, he witnesses the sacred Black Hat Dances in the fortress-like Dzong; archery contests in town; and the unfolding of the giant scroll, or thankha, during the night of the full moon. In a bar in the capital, Thimphu, Michael discusses reincarnation and the pursuit of happiness with Dash Benji and Ashi Khendum, the King’s cousins, and en-route to Bangladesh is taken by Benji to Popshika valley to see the extremely rare black neck cranes. Adventure Associates invites you to experience some of this magical kingdom with their 16-day, fully escorted tour; “Bhutan, the Last Shangri-La.” Departing Australia on April 15, 2005 there are only a scant few places remaining on this much sought-after tour. And with strict tourist quotas applied by the Bhutanese Government, these numbers are definitely limited. Please book immediately! As politicians and union officials debate the many facets of parental leave, Australia’s longest established tour operator to Antarctica, Adventure Associates, reminds us of some exemplary behaviour already existing in the natural kingdom. The largest of the world’s 17 species of penguin, the majestic Emperor of Antarctica, raises its young on the hard sea-ice of Antarctica huddled together against the biting winter winds. In a display of paternal instinct uncommon in the animal world, this intensely arduous task is performed by the Emperor males alone while the females stock up on food for a spring-time return. The "Emperors of Antarctica" expeditions aboard the icebreaker Kapitan Khlebnikov, offer adventurers the rare opportunity to visit the Emperor Penguin colonies in the Ross Sea before the fledglings leave for the open ocean. Dr Kirsten le Mar, a naturalist who has worked for several years on Adventure Associates’ voyages, has studied Emperors in detail. 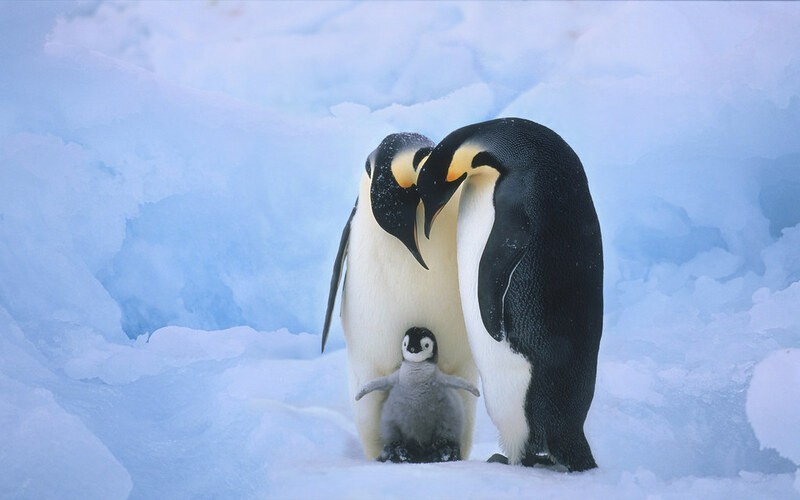 “The male Emperor Penguin is virtually abandoned by the female after the single egg is laid. He is left alone for the 70-day incubation period during the dark and bitterly cold winter months, going completely without food for this period, the male feeds the newly-hatched chick with thin regurgitated “milk”. The females occasionally fail to return from this dangerous quest, falling prey to Orcas or leopard seals. The male is then faced with the heart-breaking decision of having to abandon his chick before he himself starves to death. The surviving young chicks grow slowly at first, taking on their distinctive black and white plumage around the head that gives them a great deal of appeal to observers and photographers. At about seven weeks of age, the young huddle together in crèches for warmth while the parents search for food to satisfy their hungry little ones. With the approach of summer, the ice breaks up, bringing the open ocean closer to the colony. It is during this time that most shipboard visitors arrive and many chicks are well advanced and the first are beginning to moult. By January the young are ready to fend for themselves and head out independently to the open ocean, saying goodbye to their devoted parents forever.